“It looks like something out of the sea,” my husband picked up the vegetable displayed on the farmer’s stand. 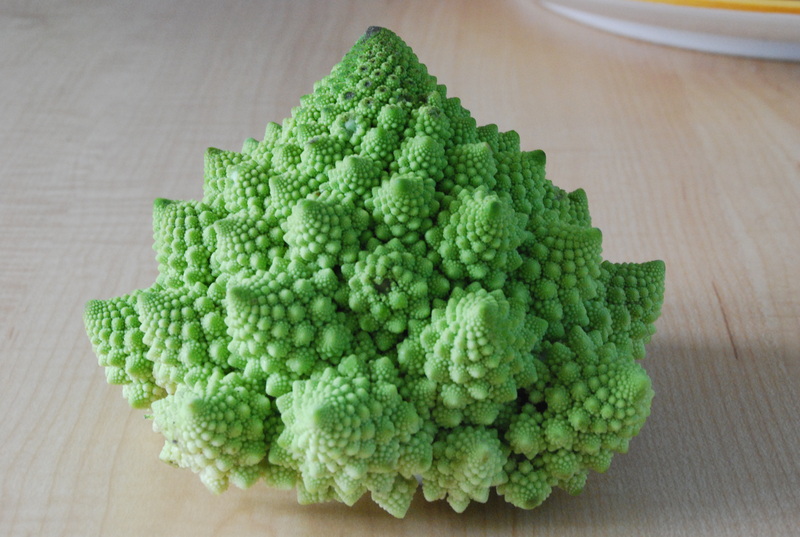 I had seen romanesco cauliflower only once before when my daughter brought one home from Mom’s Market. “Yeah, like coral.” The green spiral cone shapes of the romanesco cauliflower make it beautiful to look at as well as eat. Even though my cauliflower mash recipe completely smashes out the fractal beauty of the vegetable, at least it keeps its pretty Chartreuse color. It’s delicious. In fact, I think it will be on my Thanksgiving Day table. Here’s how you cook it: cut off a whole head of cauliflower buds. Throw away the core center. Dump the buds in a steamer with sliced onions or shallots and cook till soft. (Use your own judgement on how much onion or shallots you want–I put in just one shallot bulb.) Mash it up with a potato masher and some roasted garlic cloves (I added about four cloves), about an 1/8th cup of cashew butter, and 1/4 C coconut manna. That simple and incredibly delicious. Cauliflower is a pretty bland vegetable but boy can it fight. It is a powerhouse of vitamins, fiber, and phytochemicals. Sometimes our prayers for others can seem pretty bland, too. Not every prayer is a spirit-filled literary masterpiece but they sure do have a lot of power. Praying for people is a good way of loving them from afar. Many times people’s names just pop into my thoughts while I am praying, and later on I find that the impulse to pray for that person was a timely one. So many times this has happened to me, that if I think of someone who I haven’t thought of for a long time, I take it as clue to pray for them. I think many of the people I have known throughout my life will be surprised in heaven when they find out how often I have prayed for them. In my own opinion, I think that God knows who has feelings of true love for whom, and that He uses the powerful love we feel for those special people in our lives to bring blessings to them. In this way we can truly say, no love is lost. I have a friend who was actually awakened from her sleep with the urge to pray for her son! The next morning she got news of his perilous situation and that he had thankfully, survived it. We don’t have to say a lot of words, or even any words. All we have to do is lift the person up to God, thanking Christ for His amazing love and for that love to surround him/her. How great and grand is our glorious God who counts the prayers of people like us worthy to be received by Him. We are honored and privileged above all to be included in His loving blessings to other people. Nothing makes me feel more like a child of God than to hear that my bland cauliflower prayers have been received and answered by the almighty God. God takes our simple prayers and adds the beauty and flavors of His blessings to pour out upon those for whom we have prayed. Whoa – a fractal delight! It is pretty cool looking!